Likes: Tea, tidiness, teaching her students, encouraging others, cheesecake, singing, music, power naps. Dislikes: Bullying, frustration, being talked over, messy artists, Pi tantrums, invoice season, people seeing her sketchbooks. Bio: Flashy, chatty and forever your personal cheerleader, Meio Dia is Spectramis' second in command. Fiercely protective of her G2 students, Meio Dia tries her best to be the voice of reason and emotional support for when the other artists need her reassurance. Meio Dia is friendly to everyone, even the people who try her patience (which is seemingly limitless). 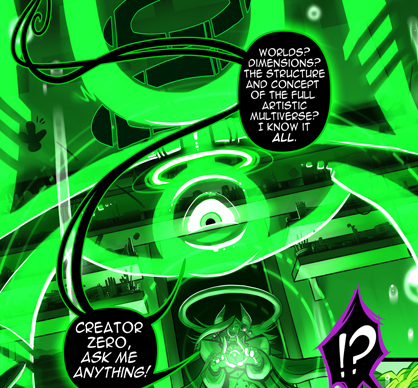 Hugely powerful with an impressive array of self taught skills to her resume, Creator Fermata worked incredibly hard to be in her position of authority. Meio Dia comes from the older classic generation of Creators before Imagni and Co showed up. Despite the age difference she's very a modern thinking creative and adapts to changing times easily (much to the dismay of her own group). Meio Dia is not a traditional painter but something of an anomaly. Her talent lies in the realm of sound wave production and control. This is used for offensive, defensive and purely entertainment purposes when she's goofing around. Music is her love. Fermata's Flow control is incomparable to any other Creator and she takes great pride in her abilities. A champion of positivity and purpose, Meio Dia honors the Folio rules with a grin on her face and a bounce in her step.